I loved searching for shells on the empty beach on our morning walk. 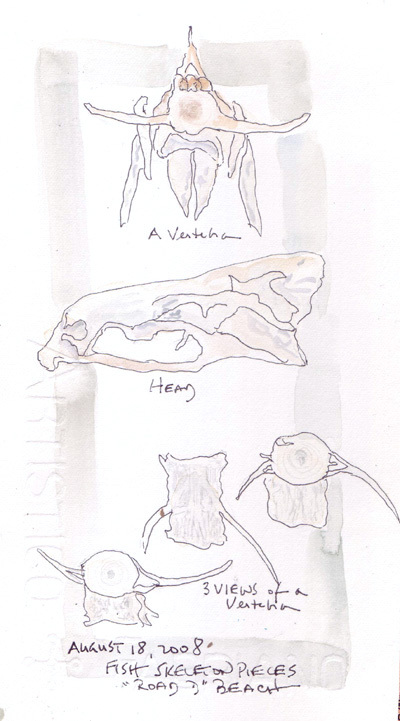 We usually arrived about one hour after high tide and on our walk one morning we found 3 very clean parts of a fish skeleton at the water line - a head, one large vertebra, and one small vertebra. My daughter and grandchildren were equally interested in examining the backbone and asked us to look for more for a collection. But none were found. 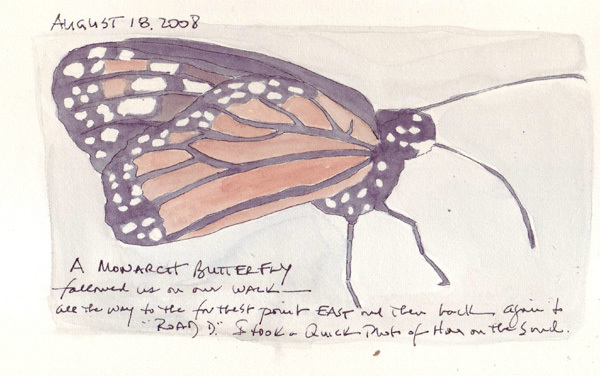 Another morning a Monarch butterfly accompanied us on our entire walk. Just before we left, I was able to take a photo while the butterfly landed briefly on the sand. 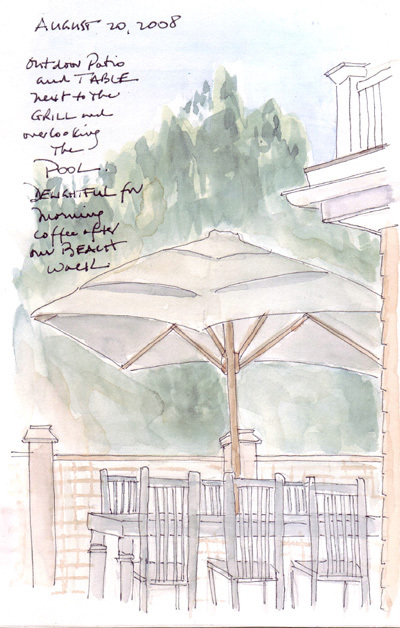 We loved having morning coffee after our beach walk on the back deck under the umbrella. 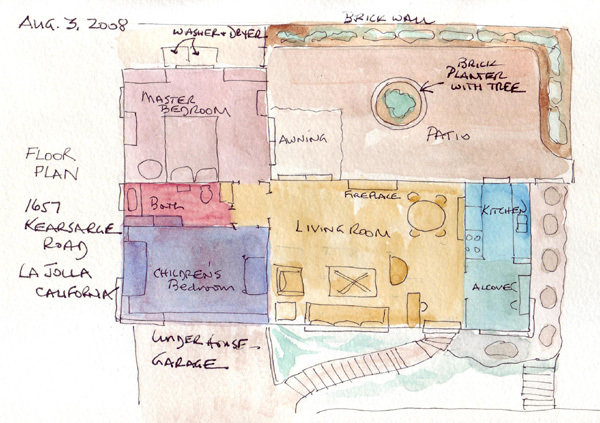 My sketch is missing the bottoms of the 3 chairs across the table - it just got too complicated for me spatially. 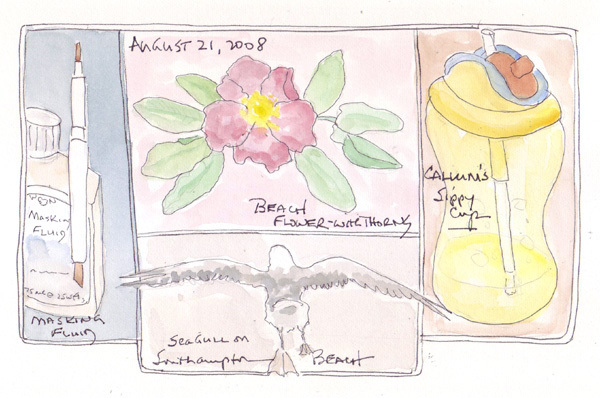 Our final day - my masking fluid and tool for putting the mask on the paper, a beach rose, one of the seagulls immediately before flight, and my youngest grandson's sippy cup which was sitting in front of me while I was sketching. We spent almost one week with our daughter and grandchildren at a summer rental in the Hamptons and I was able to complete my recycled book that I dedicated to summer vacation travel. Selected pages will be uploaded over the next few days. 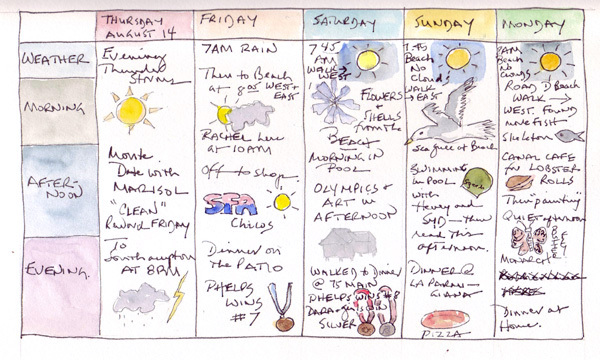 I loved the "Creative Matrix" idea in Dory Kanter's book Art Escapes and then decided to try it when Martha of Trumpetvine Travel posted hers as a calendar from her recent vacation in the woods. Here is the first page of mine. 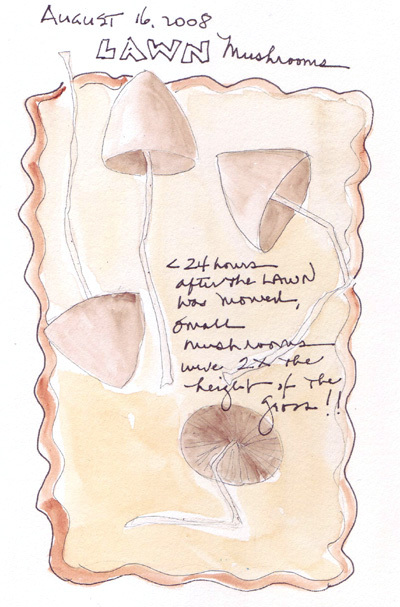 The house lawns were mowed the first afternoon we arrived, and I was shocked to see fully formed mushrooms, that were twice as tall as the grass, appear the very next day. They were very delicate and disappeared completely by the following day. I'd love to know the type of mushroom - research must be done. My husband and I walked two miles on the beach early each morning and collected shells and other "treasures." 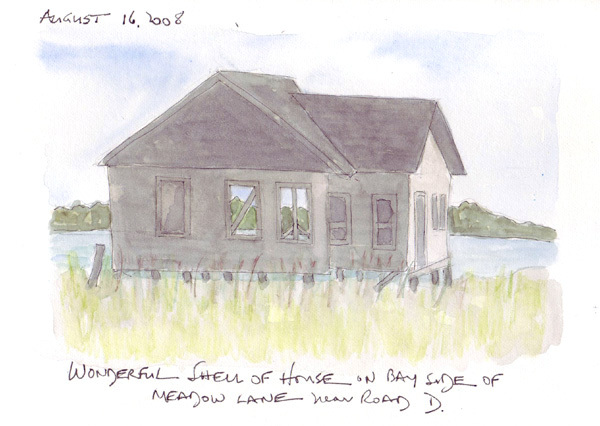 The road to the beach is on a narrow strip of land between the bay and the ocean and I loved a deserted, weathered, wood shell of a house that was up on stilts at the edge of the bay. 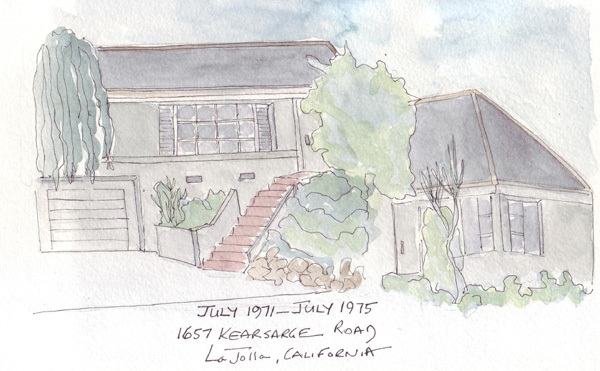 It was possible to look right through the windows and doors that were not boarded up. We occasionally met someone on the beach walking their dogs, but except for them we shared the beach with the seagulls. 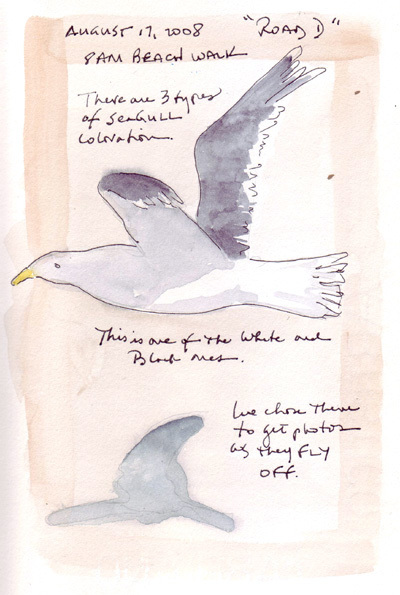 I read that there are 80 varieties of gulls and wondered about the three patterns of coloration of the gulls we saw. Here is one of the gulls and the shadow that he cast on the sand in the bright sunlight. 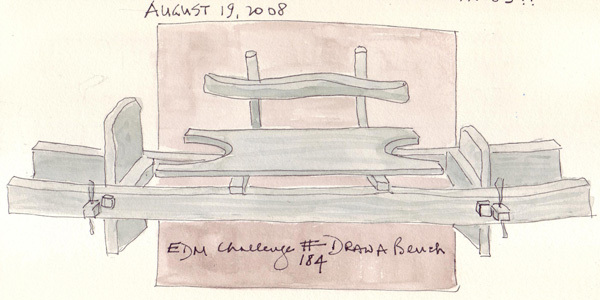 We were at the beach with our daughter and grandchildren for a week, and I finally found a bench I wanted to sketch. We had shrimp tacos for dinner at LaFondita in Amagansett, NY and the garden sculpture company behind the restaurant displayed this granite and wood bench on the edge of the pond. The wood was weathered like the traditional benches along the streets near the beach and the composition and balance between elements was extraordinary. If only I could have studied and painted the grain on some of the wood. The brown-pink painted square behind the bench is my painted background for the sketch. 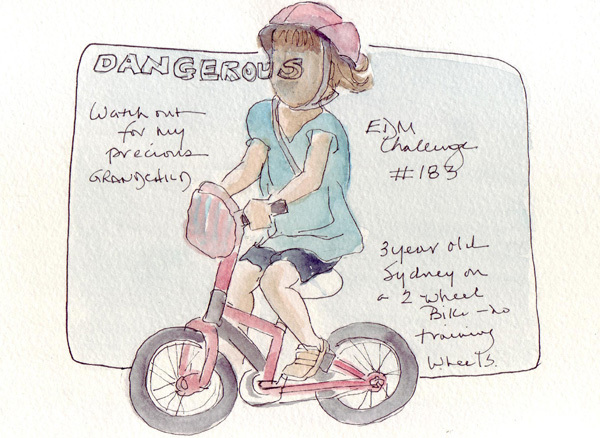 The image that I kept returning to for the EDM Challenge "Draw Something Dangerous," was my precious little 3 year old grand daughter Sydney who can now ride her two wheel bike without training wheels! 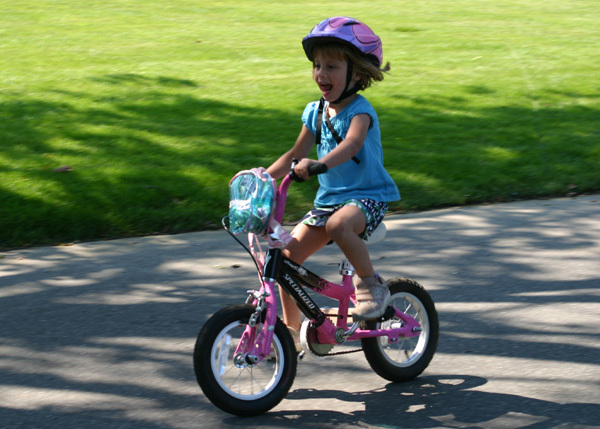 She rides it on a quiet street in front of their summer house with adults all around her, but she is soooo tiny on it! My sketch doesn't show the joy on her little face, so here is one of many pictures taken while she whizzed by.